Fair enough. This is to be expected for a while after sales open for a hot event like this. Wait, what? How is this fair? I’ve gone to a decent amount of concerts with hard-to-get tickets. I even managed to snag tickets to see Neutral Milk Hotel (and I still hate my immune system for failing me and keeping me away from that show); this has never happened to me before. 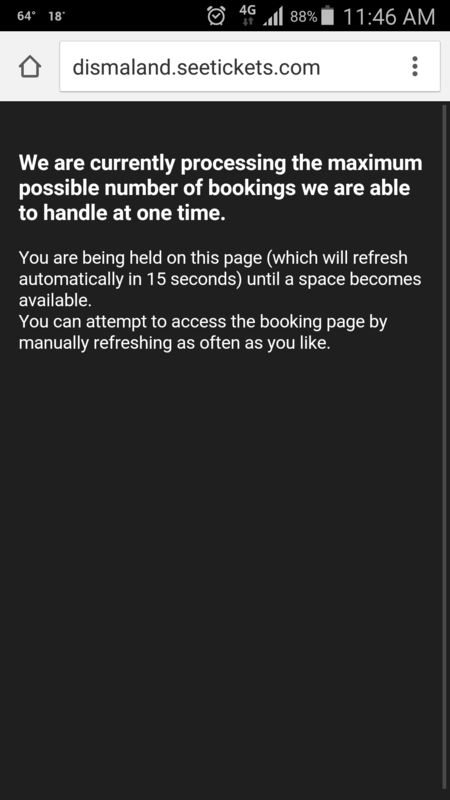 With Ticketmaster, they give you a nice little count-down in the corner of the screen telling you how long you have to get your act together before they give your tickets away to someone else. 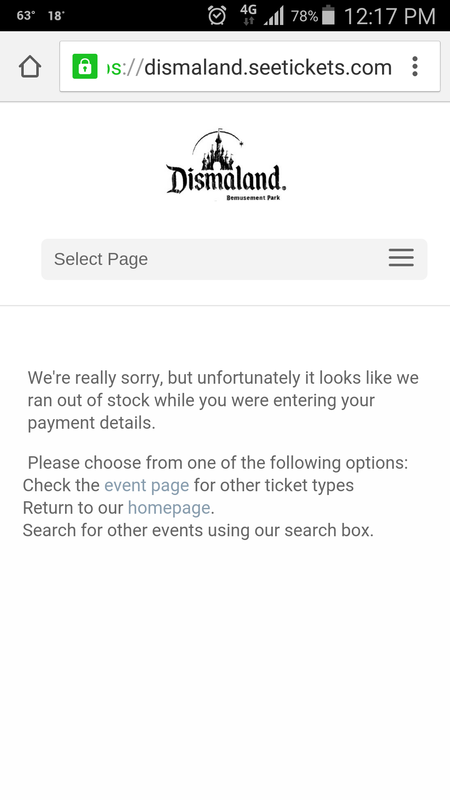 On this site, it literally appeared to be that if I didn’t pay immediately, I would lose the ticket. I've had a ticket in my cart THREE TIMES and once I enter my payment info it says it's not available anymore. What the heck?! I mean, it obviously worked for some people. Tickets are sold out through the 15th. The park is open through the 27th of September, so in theory I could still get tickets. I’m just so frustrated with this buying experience. I have to say that getting tickets for Disneyland was a whole lot easier. This entry was posted in activities, europe, tourist, travel, UK, visit and tagged activities, art, Banksy, bemusement park, Dismaland, doubt, expat problems, graffiti, let it go, sad, travel, twitter. Bookmark the permalink.